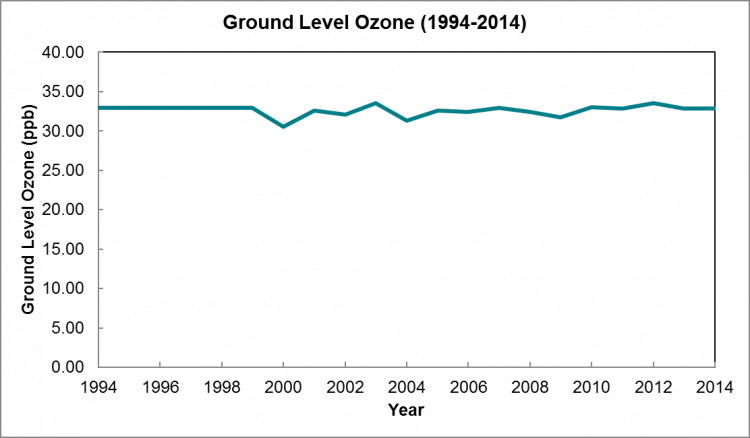 Ground-level ozone is a colourless, odourless gas that is a key component of smog. Ground-level ozone is formed with gasses created when fossil fuels used in our cars, power plants, and other industrial activities meet in sunlight. Data for this indicator are collected by Environment and Climate Change Canada and reported in parts per billion. Ground-level ozone is important to consider when thinking about wellbeing because it has a negative impact on air quality. Poor air quality can lead to a number of health problems especially respiratory disease.